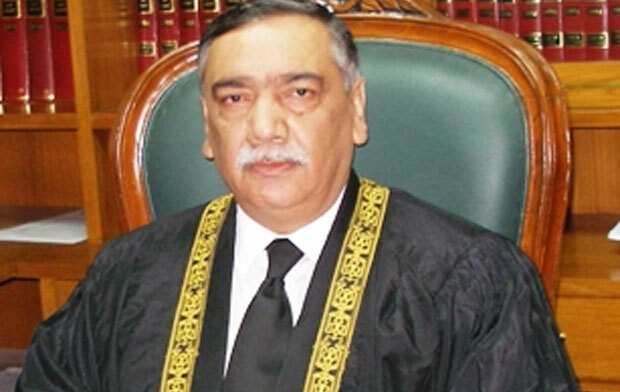 Justice Khosa U-Turn on Rule of Law? Only a few months ago, Supreme Court of Pakistan maintained the conviction of Salmaan Taseer’s killer Mumtaz Qadri and even re-included terrorism charges so that there can be no doubt of his crimes. Heading the bench, Justice Asif Saeed Khosa gave a strong statement about the importance of respecting rule of law especially on sensitive matters. “Will it not instil fear in the society if everybody starts taking the law in their own hands and dealing with sensitive matters such as blasphemy on their own rather than going to the courts,” Justice Asif Saeed Khosa had later asked. Quoting instances such as the lynching of a Christian couple in Kot Radha Kishan, Justice Khosa had asked whether an individual has the right to act on his own in such matters without even first ascertaining the facts. Justice Khosa was praised at the time for his bravery in making this statement, but now there are questions about whether Justice Khosa’s courage has reached it limits as the justice appears to have made a massive U-turn on the importance of rule of law. According to media reports, a Supreme Court bench has denied bail to the publisher of 102-year-old Ahmadiyya publication Al-Fazl despite that he has been rotting in prison for three years on blasphemy and terrorism charges even though the police had yet to submit the case’s challan in trial court. Here is what Justice Khosa reportedly said this time. Justice Khosa observed that unfortunately when matters pertaining to religion were under consideration one had to ignore the law. In one case, Justice Khosa bravely states the importance of rule of law. Few weeks later, a complete U-turn and he justifies ignoring the law if matters of religion are under consideration. Isn’t this the same justification used by TTP terrorists? This is a dangerous precedent if a respected Justice of Supreme Court of Pakistan has declared that law may be ignored if matters of religion are involved. There must be an investigation and explanation provided by the Court. President Mamnoon Hussain should take notice of these reports and if necessary refer Justice Khosa to Supreme Judicial Council for review. Otherwise, a Justice of Supreme Court may have declared any illegal acts can be justified if matters of religion is involved. This entry was posted in Blogs and tagged Ahmadi, blasphemy, constitution, Justice Khosa, rule of law, Supreme Court by Mahmood Adeel. Bookmark the permalink.